Our mobile shredding trucks are equipped with high-end shred machinery and video surveillance for efficient and secure shred jobs each and every time. On-site Document Shredding means you don’t have to leave your workplace to have documents destroyed. 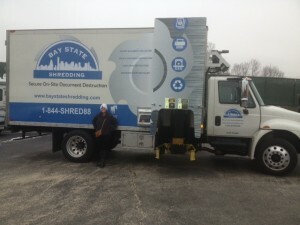 Our Mobile Shredding Fleet will come to your Massachusetts business and complete the shredding process directly before you. Our mobile shredding service is quick and cost-effective and backed by a Certificate of Destruction for peace of mind.